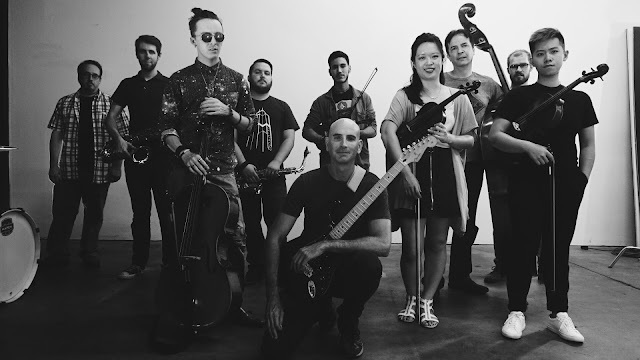 Wastin' Time by The Mercy Stone, a 12 piece ensemble founded by composer / guitarist Scott Grady (in 2016) is a dreamy rhythmic kind of garden rock affair with progressive tendencies built on layers of vocal harmonies with melodies that sort of chase each other. The song surprisingly ends with a single embrace of cello and strings in such a way that you are left wanting more, much more. Grady's desire to fuse together a neo classical concert stage sound that a "rock" audience would get into amassed accomplished musicians from all over to create a hybrid of classical, rock, pop, raggae, metal, funk, psychedelic and varied world music elements too.